This profile is the second in a series. You should first read the Lance-Constable Carrot Ironfoundersson profile. In addition to his strength and combat skills, Carrot is almost supernaturally likeable, able to mesmerise crowds even if they don’t speak the same language. Carrot’s insatiable curiosity means he learns a lot, either from reading or talking to people. He also knows a lot about Ankh-Morpork, more than even Vimes in some areas, and often knows most people he meets there by name. A corporal by this point, Carrot was immediately smitten by new recruit, Angua, and began courting her. Being Carrot, this involved showing her around particularly fascinating museums and suchlike. She remained interested nonetheless. He learned she was a werewolf when she was accidentally exposed to a full moon. His shock at the revelation sent her running in fear of his reaction. Angua returned to face him, and intercepted a shot that would have killed him, apparently dying herself. Carrot went after the killer, but stopped Vimes murdering him because it was their duty to apprehend criminals, not to punish them. When left with no choice, Carrot did kill him, quickly and cleanly. He then returned to Angua’s side, and stayed with her hoping her werewolf nature would return her to him. It did. He apologised for his earlier reaction, and they made up. While his lineage was now an open secret to some, and to Carrot himself, he never directly commented on it. The most he’s said was when Lord Vetinari obliquely questioned him, and Carrot implied he considered his subjects best served by him continuing as a watchman. 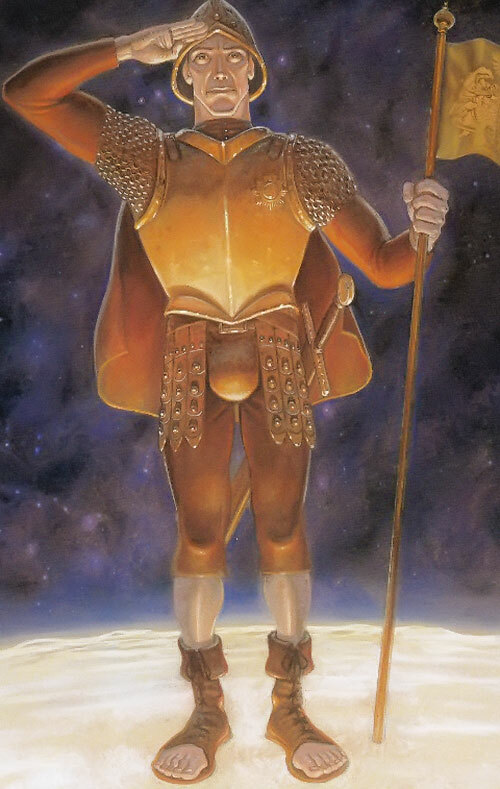 Captain Carrot was intended to succeed Vimes when he retired, but was happy when Vimes decided against retirement. When Vimes’ had arrested the opposing armies and was negotiating with their leaders, Carrot had soldiers from both sides playing football against each other. Carrot was distraught when Angua vanished, and felt he had no option but to resign from the Watch, despite Vimes being away for the time and command falling on the unprepared Colon. Realising Gaspode could talk, Carrot got the dog to help him follow Angua’s trail. They got into trouble eventually, and Carrot would have frozen to death or been eaten by wolves had Angua not turned back for him. She’d run off with an old beau, the wolf Gavin. Gavin had warned her that her brother, Wolfgang, was up to something back in Uberwald. Carrot and Gaspode accompanied them. Reaching Uberwald they joined Vimes, who was there as ambassador, and confronted Wolfgang. Carrot fought him, but did so honourably. Wolfgang fought less honourably, and seriously wounded Carrot. Carrot only survived because Gavin gave his life to save him. Wolfgang was driven off, but returned later to injure Angua, before being killed by Vimes. Carrot and Angua returned to their life in Ankh-Morpork. 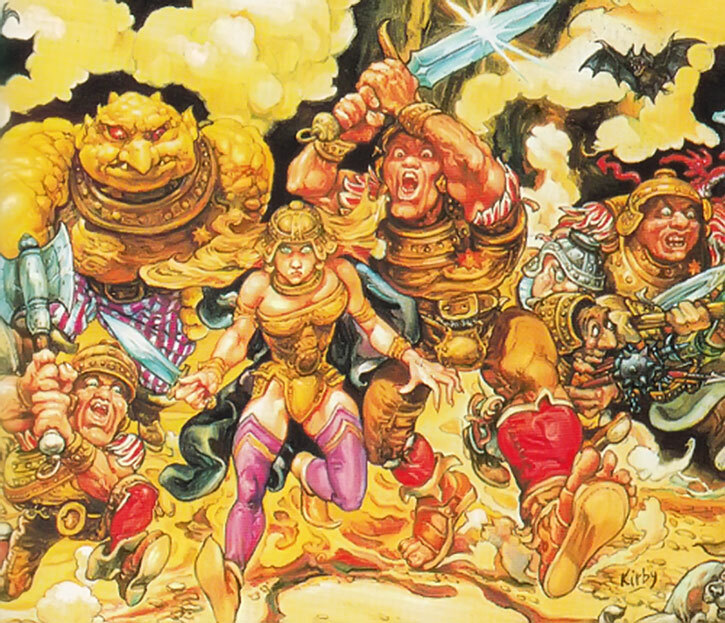 When the Silver Horde, a group of aging heroes led by Cohen the Barbarian, travelled to the home of the gods in Cori Celesti intending to blow it up, the wizards of the Unseen University learned it would cause the destruction of the entire Disc. A mission was quickly planned to use one of Leonard of Quirm’s flying machines, the Kite, to reach Cori Celesti in time to stop them. Carrot quickly volunteered, joining Leonard and the wizard Rincewind. Dropping off the edge of the disc, the Kite swooped around the far side and landed on the moon to take on air. This was necessary as their calculations had been thrown out by the Librarian stowing away on board. Dropping from the moon they crashed into the city of the gods just as the Silver Horde were about to detonate their bomb. Carrot faced the Silver Horde, who were concerned that 7 of them onto one of him meant he’d be the hero of the piece, so the odds were against them. Rincewind managed to convince Cohen that what he was doing would end everything, leaving no one left to remember their exploits. The Silver Horde carried the bomb over the edge of Cori Celesti, to explode miles below. The Kite was repaired, and the crew returned home. Almost pathologically cheerful, Carrot looks for the good in almost everyone, and takes an interest in people, making them feel interesting. This attitude make him extremely likeable. Even those who don’t like him may be so confused and curious what he’s really up to that they’ll be mesmerised by his presence. His treating people better than they might expect often makes them want to be better for his sake. Many take his openness to be stupidity, but he’s far from this. He knows some people don’t listen to their good side, and is not easily fooled. Disappointed, but rarely fooled. He can fit in anywhere, looking as though he belongs, and the surroundings are there to suit him. He’ll do his best to get along with whoever he finds there, and to get along with the job at hand, taking pride in how he does it. Within a month in a place he’ll probably know everyone there, being a friend to all. 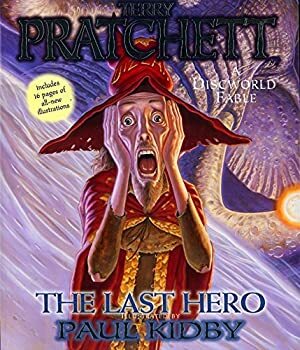 Reluctant to lie or employ any form of deception – and his face twitches whenever Vimes lies in his presence – Carrot is nevertheless willing to mislead with complete honesty. When someone asked if he had permission from the head of the guild, Carrot responded truthfully that he’d just spoken to him, omitting that permission hadn’t been raised. His honesty can cause some problems, as can his reluctance to act dishonourably. Against a truly dangerous opponent his strict adherence to honourable combat can put him at a disadvantage. Early on he still had some trouble with metaphors, taking everything literally, although these days he generally only does so intentionally. While his being the last heir to the throne of Ankh-Morpork is an open secret, it’s not one he openly confirms. He has an unspoken understanding with Vetinari with which they’re both content – Carrot will sometimes offer suggestions, such as elevating Vimes to Duke, and Vetinari has the backing of the unofficial throne should it ever be required. All the while Carrot sees to the well-being of his subjects to the best of his duty. 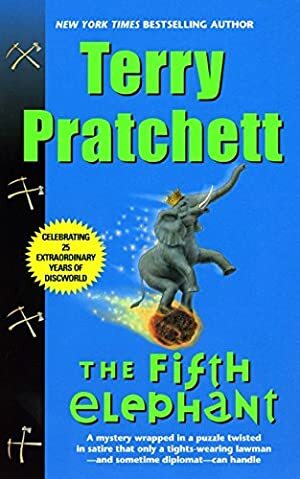 While Carrot sees Vetinari as a good ruler, his loyalty is firstly to the law and the good of the people, secondly to Vimes, and thirdly to Vetinari. 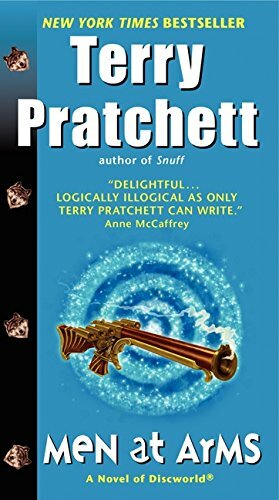 While Carrot accepts Vimes has his faults, and sees part of his role as helping his mentor do as he would wish to, he sees the Commander as a truly good man who will always do the right thing, regardless of the law. 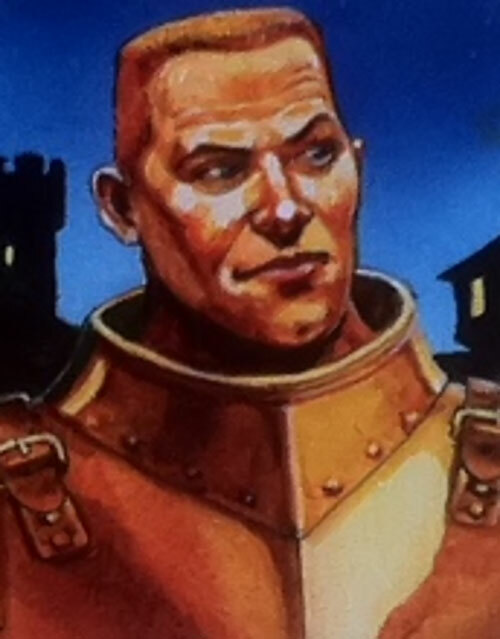 As Vimes constantly fights his urges for a harsher justice by forcing himself to obey the law, Carrot uses an adherence to the law to prevent his natural charisma making people obey him according to his whims. Area Knowledge (Ankh-Morpork), Expertise (Laws and history of Ankh-Morpork), Familiarity (Sewing), Iron Nerves, Language (Dwarfish, Klatchian), Omni-Scholar, Police Credentials (Captain in the Watch, Medium). Watch (High), Angua (High), Ankh-Morpork dwarf community (Low). Short Sword [BODY 05, EV 04 (06 w/STR, 07 w/Martial Artist)]. Truncheon [BODY 04, EV 03 (06 w/STR, 07 w/Martial Artist)]. Pike or Halberd [BODY 05, EV 04 (06 w/STR, 07 w/Martial Artist)]. Writeup completed on the 2nd of September, 2014.